Thousands of Ethiopia's came to show their respects at the funeral of the person behind Ethiopia's ambitious mega project that will be the largest hydro-electric dam in Africa once completed. 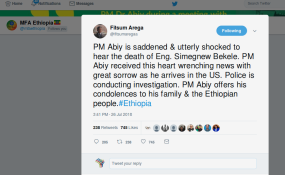 Chief engineer and project manager of the Grand Renaissance Dam (GERD) Simegnew Bekele was found shot dead in the capital Addis Ababa on Thursday, according to the BBC. A gathering of mourners outside the state broadcaster on Thursday led to police firing teargas at the crowd as they called for those who were responsible for his death to be brought to justice. Police are still investigating his death.